Charles Brock’s Sculptured Low Back Dining Chair is not only a great chair in a set for dining, it is a beautiful contemporary chair for any occasion. Every part melts into the next, giving it a flowing organic quality. The lumbar support is not incidental; it’s planned. Just slide down into it and you can comfortably sit for conversation, reading or just daydreaming. 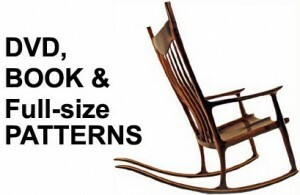 Charles Brock’s lively 103 minute DVD plus 48-page book with 72 color photos plus two 24″ x 48″ full-size patterns provide you with all the knowledge and confidence you will need to build your own sculptured rocker. 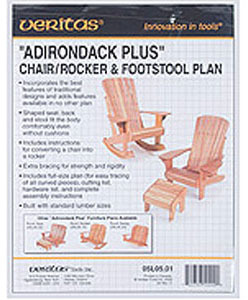 These Adirondack chairs are graceful as well as comfortable. 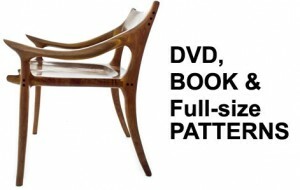 The shaped seat and back fit the body, making them comfortable without cushions. The full-scale plans include cutting lists and detailed construction notes, use standard lumber sizes and are designed with extra bracing for strength and rigidity. 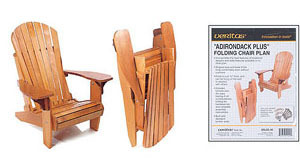 These Adirondack Folding Chairs are designed with all the same features that make the fixed chair so comfortable, this one folds to only 12″ deep. When folded, it may be hung on a wall or stacked with others. Folding the chair is as simple as lifting the seat back upward out of two pockets and closing the chair flat. The Modern Bench Plan will provide an easy-to-follow design for building your own bench. Finished top is 24 inches by 80.5″, and the bench is structured to take any Veritas front vices at the front or end position. Didn’t see what you want on this list? 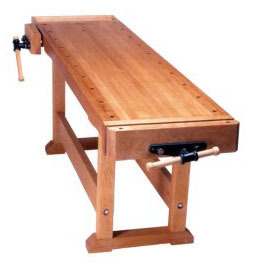 Check out our full Top Ten Woodworking Plans list and find your next project today!